Nintex is an online provider of workflow automation solutions for various businesses. Touted as the world’s leading workflow company, it automates processes on and between today’s most used enterprise content management systems and collaboration platforms, connecting on-premises, cloud workflows, and mobile users. It also helps organizations automate their business processes quickly and easily. As such, Nintext provides a quick and easy way to streamline processes in a straightforward manner, integrate content, and empower people wherever they are. It’s about people-driven design and people-friendly participation and improving processes – from the everyday to the elaborate. It’s about working with content no matter what or where it is, and routing it to the right recipients in the best way for them to use it. The best part about this software is the flexible pricing scheme it offers, as it helps regain control of all business processes on a price that corresponds to what the company genuinely can offer. Be it a small, medium, or a large business, Nintex can help you understand and automate all operations. Nintex puts the power to improve work in the hands of the people who best understand their processes. From newcomers to seasoned workflow professionals, everyone can benefit from Nintex’s workflow automation platform. As a platform, it delivers the work to you effortlessly on your part instead of making you learn yet one more system or doing mundane tasks on your computer. The platform does well integrating your workflows with the social media, instant messaging programs, content, email and applications you already use, with a seamless and practical integration of all of your data and documents. In addition, it also offers an easy drag-and-drop workflow design that saves valuable IT staff time. It focuses on being easy (reducing steps) rather than by being simple (reducing choices). It’s how our platform is powerful enough for elaborate enterprise work but approachable enough for everyday departmental work at the same time. You will be able start up and run it quickly, and to build multiple workflows faster than any other solution out there. 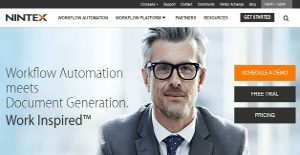 Existing customers see a fast return on investment and are eager to find new processes that can benefit from automation as workflow solutions based on the platform help save time and money that they can devote to their most critical projects. What is even more important is that Nintex is priced on quote basis, and allows users to design their own feature suite for a price that would genuinely suit their financial capacity. Contact the company for more details, and ask for your quote. If you are considering Nintex it might also be sensible to check out other subcategories of Best Business Process Management Software collected in our base of B2B software reviews. Every business is different, and can require a specific Business Process Management Software solution that will be designed for their company size, type of clients and employees and even specific industry they support. We advise you don't count on locating a perfect app that will be suitable for every business regardless of their history is. It may be a good idea to read a few Nintex reviews first and even then you should pay attention to what the solution is intended to do for your business and your workers. Do you need an easy and straightforward app with just elementary functions? Will you really use the complex tools required by experts and large enterprises? Are there any specific features that are especially beneficial for the industry you operate in? If you ask yourself these questions it is going to be much easier to locate a solid app that will match your budget. How Much Does Nintex Cost? We realize that when you make a decision to buy Business Process Management Software it’s important not only to see how experts evaluate it in their reviews, but also to find out if the real people and companies that buy it are actually satisfied with the product. That’s why we’ve created our behavior-based Customer Satisfaction Algorithm™ that gathers customer reviews, comments and Nintex reviews across a wide range of social media sites. The data is then presented in an easy to digest form showing how many people had positive and negative experience with Nintex. With that information at hand you should be equipped to make an informed buying decision that you won’t regret. What are Nintex pricing details? What integrations are available for Nintex? Pros: Nintex allows both IT and our business users to build, publish and manage the workflows by using its drag and drop interface into Office 365. The design process is easy and powerful and it offers lot of rules and controls that replicate to mobile platforms. Cons: The form designing can be complicated to work with but the roadmap is pulling updated interfaces so it can make the response forms simple to build. Pros: Nintex is easy to set up and you can easily learn how to use it. It integrates perfectly with SharePoint and those to make powerful solution that help us to better automate all pur processes in less time. It is quick solution and it helps us to be more productive. Cons: It is not made for large projects. Because it is integrated with SharePoint we cannot move the Nintex with solutions that have outgrown the SharePoint list size. The tool’s workflow lists slows doen our search indexing. If you need more information about Nintex or you simply have a question let us know what you need and we’ll forward your request directly to the vendor.